My first “Equal Opportunity Bread” (see my last post) had to be a batch of rolls. 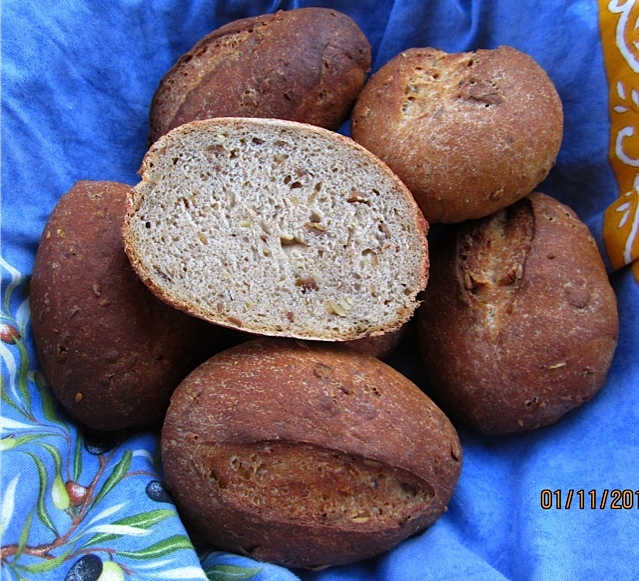 I like having a supply of rolls in my freezer, when we come home from a trip, and want a bread that thaws less sluggish than a large loaf. So I grabbed one of my most favorite baking books – hey, who said I couldn’t include my favorites in my fair baking? 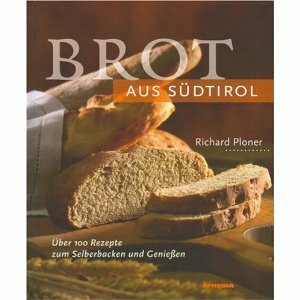 – “Brot aus Südtirol“. Richard Ploner’s breads are all small, mini breads, or rolls. The (professional baker’s) reasoning: “They should all have the same size in a mixed bread basket”. This baking book has everything going for it, interesting recipes and appetizing photos. Unfortunately, it has not been translated into English, yet. Because of this sad omission I am happy to be able to translate at least some of its wonderful recipes for English speaking bakers. The one thing I always change – apart for an adaptation of the ingredients to what is available in the US – are the very short fermentation times. Ploner doesn’t retard his doughs, but I do, using either pre-doughs or the Stretch-and-Fold technique (S + F) and I am sure that even these nice breads benefit from it. The original recipe lists sugar caramel color (15 g) – I didn’t have it and didn’t see a real need for it, either. Richard Ploner lets you choose between toasted soy flakes and pumpkin seeds – for me a no-brainer, since I love toasted pumpkin seeds, and buy them in bulk. The sesame seeds I toasted, too, to enhance their “nuttiness”. 1. Dissolve instant yeast in warm water. (Though this is not strictly necessary, it helps with the stretch-and-fold technique.) Mix with other dough ingredients to form a rough ball, 1 – 2 minutes on low speed (or with a wooden spoon). Let dough rest for 5 minutes. 2. Knead on medium-low speed (or by hand) for 2 minutes, adjusting tablespoon-wise with more water, if needed (dough should be a bit sticky). Continue kneading for 4 more minutes, the last 20 seconds at medium-high speed (dough should still be more sticky than tacky). 3. Transfer dough to a lightly oiled work bench, and, with wet or oiled hands, stretch and pat into a rough square, then fold it in thirds like a business letter. Fold it the same way again from the short sides. Tuck sides under dough to shape a ball, and place dough package in oiled bowl, seam side down. Cover, and let rest for 10 minutes. 4. Repeat S & F for 3 more times at 10 minute intervals (total time 40 minutes). After the last fold, place into oiled container, cover, and refrigerate overnight. 5. Remove dough from refrigerator, it should have doubled in size. 6. Preheat oven to 428ºF/220ºC, including steam pan. Divide dough into 10 equal pieces. Pre-shape into rounds. Cover and let relax for 5 minutes. 7. With both hands, roll rounds into 10-cm/4″ long strands, with tapered ends. Place, seam side down, on parchment lined baking sheet. Score lengthwise. Mist with oil spray, cover with plastic foil, and let rolls rise for 45 – 60 minutes, or until they have grown ca. 1 1/2 times their original size. 8. Bake rolls for 12 minutes, steaming with 1 cup of boiling water. Remove steam pan and rotate rolls 180 degrees for even browning. Continue baking for another 13 minutes, until they are golden brown. Leave rolls in switched-off oven with door slightly ajar for 5 more minutes, then let them cool on a wire rack.